Rising kindergartners celebrate their graduation from Stepping Stones; a summer school readiness program offered through EDCI partnerships. Inspired by Paul Tough’s book, Whatever it Takes, which documents Geoffrey Canada’s development of the Harlem Children’s Zone, community leaders in Durham were determined to implement a similar strategy in East Durham. Following a succession of planning activities, community conversations, seed grants, steering committee meetings, and exploratory site visits, including a visit to Harlem, the East Durham Children’s Initiative (EDCI) was launched in 2009. The combination of widespread community engagement and targeted outreach to key stakeholders and leaders made this a powerful effort. From 2009 to 2011, EDCI enhanced its operational capacity by joining the Center for Child and Family Health, bringing together a strong leadership team and staff, building relationships with community members and donors, partnering with local organizations, and piloting several promising initiatives through early fundraising efforts. In 2012, EDCI became a private, 501(c)(3) nonprofit organization and moved its offices to the 1.2 square-mile target EDCI Zone. Like the Harlem Children’s Zone, the East Durham Children’s Initiative is a place-based initiative that focuses on providing a pipeline of high-quality cradle-to-college-or-career services for some of Durham’s most vulnerable children and families. This long-term, targeted approach helps EDCI understand specific community needs and assets, as well as build strong relationships with East Durham residents and partners. EDCI’s long-term vision is to ensure that all children in the EDCI Zone successfully graduate from high school, ready for college or career. Intentionally distinct from the Harlem model, however, EDCI’s early leadership team decided not to offer its own charter school, but rather to work with the existing public schools. EDCI President and CEO David Reese explains, “We’re a public-school model, which allows us to serve any child regardless of whether the adult in their life is savvy enough to navigate all of the educational opportunities available to children .” 5 With only a small fraction of the funding enjoyed by HCZ, in general EDCI has focused mainly on leveraging and aligning existing programs and resources rather than creating new ones. In its first five years, EDCI focused its efforts on children’s early years, from birth to fifth grade, based on the understanding that setting a strong developmental and learning foundation enables subsequent success. As the initiative has grown, EDCI has progressed into middle school and is expected to expand to high school and beyond. Our mission is to create a pipeline of services that start from the time a child is born and expand all the way until we have children who are college or career ready. Durham Public Schools: EDCI targets students in two neighborhood public elementary schools, one public middle school, and two public charter schools serving Zone kids. The initiative is also actively considering strategies that support EDCI Zone students attending non-Zone schools to help ensure continuity of services. Children enjoying a community event in the EDCI Zone. Public agencies: In addition to Durham Public Schools, which is its most important partner, EDCI works closely with the Durham County Department of Public Health, Durham County Public Library, Durham County Social Services, Durham Parks and Recreation, and the City of Durham. Nonprofit organizations and other community service providers working in areas such as early childhood, literacy, health and wellness, arts and culture, youth empowerment, family engagement, and economic development: Some of EDCI’s nonprofit pipeline partners include: Book Harvest, Center for Child and Family Health, Child Care Services Association, Diaper Bank of NC, Dress for Success, Durham Literacy Center, Durham’s Partnership for Children, Durham Together for Resilient Youth, Durham YMCA, Habitat for Humanity of Durham, The Hill Center, Kidznotes, Latino Educational Achievement Partnership, Museum of Life and Science, Partners for Youth Opportunity, Rotary Club of Durham, Student U, and Village of Wisdom. In 2015, EDCI added a Science, Technology, Engineering, Arts, and Math (STEAM) program, which is supported by over a dozen over a dozen other public and private enrichment partners, including environmental organizations and museums. Institutions of Higher Education: Duke’s Center for Child and Family Policy, Duke Health, Duke’s Office of Durham and Regional Affairs, the Nasher Museum of Art, Sarah P. Duke Gardens, NC State University, and Durham Technical Community College. To get all children to kindergarten ready to learn, EDCI enhances both in-home and paid care experiences for young children and their families. Parent education and early learning opportunities that support kindergarten readiness are key target areas for EDCI. Zone families with children ages 0–3 begin receiving services through a home-visiting nurse program called Durham Connects, followed by weekly to biweekly in-home parent education and support provided by Healthy Families Durham/Jumpstart and the EDCI Early Childhood Parent Advocate Program. Parent Advocates fill in the gaps by providing support to disconnected families through home visits and other strategies that promote early literacy, family involvement, and connections to community resources such as the state’s prekindergarten program, NC Pre-K. Staff members are trained in evidence-based models of family support including Touchpoints and Triple P.
Children listen carefully while building their early literacy skills at EDCI’s Story Hour in the Zone. Improved access to high-quality childcare and preschool are supported through strong partnerships with Durham County Social Services, Child Care Services Association, and other community agencies. These collaborations enable EDCI Zone families to receive priority for childcare subsidies and scholarships. 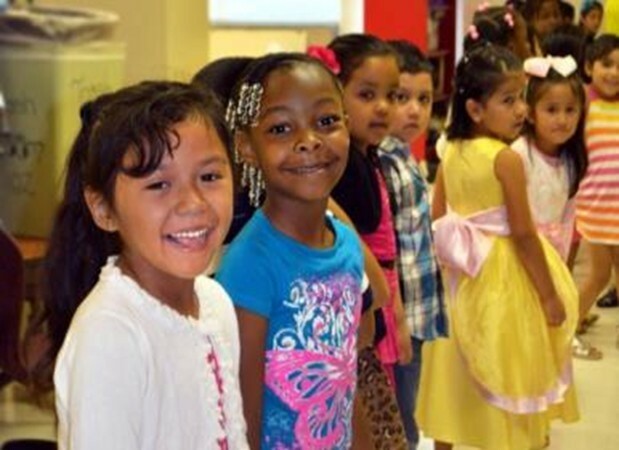 In 2015, EDCI partnered with the Latino Educational Achievement Partnership (LEAP) to open a new half-day, bilingual preschool called EDCI LEAP Academy for 30 three- and four-year-old Zone children who would not otherwise have access to preschool. Transition to kindergarten: Community-based story hours (including monthly story hours in Spanish to promote literacy among native Spanish-speaking children and their caregivers), parent groups, a summer kindergarten readiness program, and transition to kindergarten events at neighborhood schools are offered in collaboration with partners including Durham’s Partnership for Children, Duke’s Office of Durham and Regional Affairs, and the Durham Public Library. Parent engagement from their children’s birth through those students’ high school years is a critical component to supporting children’s academic success. ECI’s Early Childhood and School Age Parent Advocates are highly trained staff members whose primary role is to support family engagement in their child’s education by getting to know parents in their homes or at other convenient locations, assessing family needs and strengths, facilitating supportive home environments, and helping parents learn about and connect to beneficial school and community resources. Community-based workshops are provided by the advocates throughout the school year in areas of interest identified by parents. Advocates also help leverage other EDCI services by encouraging family involvement in the pipeline. In 2017, EDCI’s Parent Advocate team included four Advocates working with parents and caregivers of children and youth attending target elementary and middle schools, as well as three who support families with young children in the Zone. Several staff are bilingual in English and Spanish to ensure that all parents can get the support they need. Their ultimate goal is to help empower parents to be strong advocates for their children, throughout early childhood and their school careers. EDCI and its partners provide a number of high-quality learning experiences for EDCI Zone children and youth during afterschool hours and summer months. 8 These programs are geared towards providing academic enrichment and preventing summer learning loss. Since 2010, EDCI has been offering summer camp opportunities for free or minimal cost to EDCI Zone students in collaboration with partners. In 2017, EDCI successfully connected students to three camps including EDCI BELL Summer Camp, EDCI STEAM Summer Camp, and the YMCA’s Camp High Hopes. Several community partners also offer additional camp scholarships to Zone students. Students at Y.E. Smith Elementary School having fun and building relationships. In 2016, EDCI launched its first weekend program for elementary school students called EDCI STEAM Saturdays. 9 With the support of various enrichment partners, including the Museum of Life and Science, the Nasher Museum, BOOST, Triangle Land Conservancy, and others, students are engaged in a morning of STEAM-related activities (e.g., robotics, food science, coding) as well as field trips offered in six-week sessions throughout the school year. EDCI staff actively refer Zone students to additional afterschool opportunities provided by partners in the community such as Durham Public Schools Community Education, Kidznotes, Girl Scouts, Boys and Girls Club of Durham and Orange County, Salvation Army, SEEDS, and Student U.
EDCI partners with other organizations to provide some in-school, literacy supports that supplement school activities such as intensive small group tutoring (HillRAP) provided by The Hill Center, and a volunteer reading buddy initiative (Reading Rangers) implemented by the Rotary Club of Durham with school staff. Hundreds of new and used books are distributed to children and families through schools, community events, and little libraries located throughout the neighborhood. All students at Eastway and Y.E. Smith Elementary Schools in the Zone receive ten free books to take home and read over the summer through Book Harvest’s Books on Break Program. EDCI knows that children who are healthy and food secure, and whose families are informed about healthy shopping, eating, and living are more likely to be engaged and ready to learn at school. In 2016, EDCI launched a new health and leadership program for 60 fourth and fifth grade students called the Youth Leadership Council.12 This unique program empowers students to develop leadership skills, adopt healthier lifestyles, and reinvest in their community by creating solutions for EDCI Zone health challenges. Student projects have included a school-wide walkathon, a community field day, and monthly mobile farmers markets for food-insecure families. EDCI views this goal as requiring a long-time approach and laying early foundations. The initiative’s primary focus in its first five years of implementation was to establish its early childhood and elementary school services and expand the pipeline to middle and high school students as children age. In fall 2015, EDCI hired and embedded a Middle School Youth Advocate at Neal Magnet Middle School, whose responsibilities include providing in-class support for students, hosting a twice-weekly afterschool program, and referring families to programs and services. In fall 2017, EDCI created a Middle School Family Advocate position to provide additional support to the Youth Advocate and to parents of middle school students. In addition, EDCI leverages community resources and partnerships by actively referring Zone students to local youth-serving organizations such as Student U and Partners for Youth Opportunity. Future EDCI youth program expansion will include adolescent health supports, mentoring, SAT preparation, college tours, leadership training, and career exploration opportunities. EDCI Director of Program Planning and Partner Engagement Mary Mathew says that these programs will be built out over the next five years. EDCI’s Program Implementation and Community Engagement team members actively participate in EDCI service delivery and promotion, as well as neighborhood groups and events to help foster relationships in the community. EDCI builds and strengthens its community involvement through the EDCI Parent and Community Advisory Council (PCAC). This group consists of parents and caregivers who are actively involved in EDCI and meets several times a year to discuss identified areas for community input. EDCI staff regularly attend community meetings and, when appropriate, facilitate communication and collaboration on the issues impacting development and families in the Zone. To secure program and operational revenue, EDCI implements a comprehensive annual fund development plan. (By fiscal year 2016, the initiative’s budget had grown to $2.3 million,) This does not include additional investment by EDCI partner organizations in the Zone. Funding sources include individuals, corporations, and private foundations. EDCI also believes that encouraging its partners to seek joint funding, and to use EDCI’s “brand” to do so, delivers a win-win: many of these organizations cite challenges to fundraising as their biggest barrier to success, so being able to work with a respected partner that draws from diverse funding sources advances their work as well. Collaboration with EDCI also opens up funding opportunities – such as specific federal grants – for which the local organizations might not otherwise have been eligible. The East Durham Children’s Initiative can trace much of its success in supporting students, expanding, and making progress toward the goal of becoming self-sustaining to specific practices and policies, both internal to the initiative and based at the state and local level. Along with its challenges, the community also boasts many assets that support its vitality, including resident-led groups and activities, local businesses, faith-based organizations, historic housing and building redevelopment, investments from city and county agencies, and engaged children and families. EDCI works closely with families and other community members to achieve its goals. This allows for a more sustainable and replicable approach and ensures programs are tailored to specific community needs. EDCI believes that a cadre of high-quality providers with multiple, coordinated interventions provide a more stable base for positive community outcomes than a top-down, one-provider system. This model also capitalizes on existing expertise and evidence-based practices already established by Durham organizations to maximize resources and reduce service duplication. 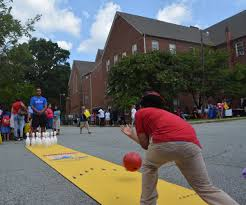 One key indication of EDCI’s commitment to meaningful community engagement is its move in 2012 from downtown Durham, where it was originally located, to the Shepherd’s House United Methodist Church in East Durham, close to Y.E. Smith Elementary School, making it much more accessible to members of the community. In 2018, EDCI will move to its permanent home in another renovated church building in the neighborhood. 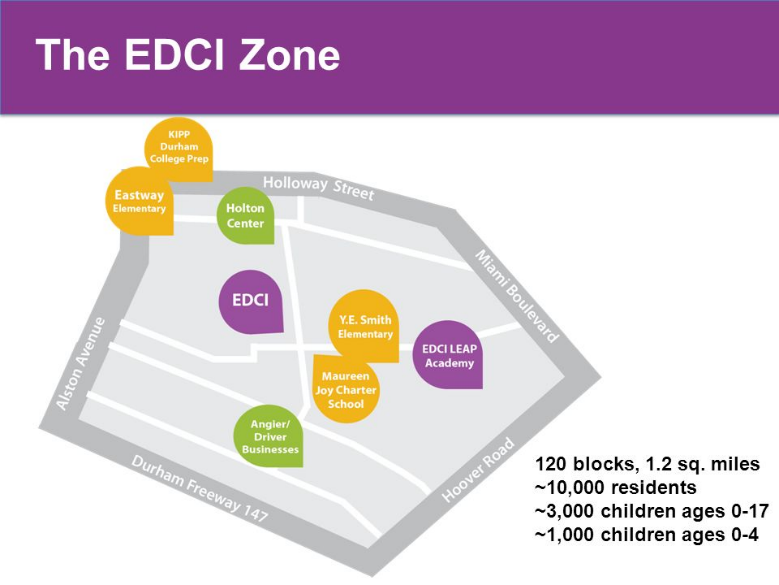 The EDCI Community Engagement Team actively engages with children, families, and community groups in the Zone to facilitate involvement in the pipeline. EDCI also uses information from its Parent and Community Advisory Council and parent surveys to shape programming; Zumba classes with free child care and the establishment of the EDCI LEAP Academy are two examples. EDCI actively works to increase connections among Zone families, schools, and partners, and to design processes for accountability and shared data collection. It convenes regular meetings of both small and large groups to highlight partner work, share information, seek feedback, and pursue joint grant-writing opportunities. The leadership team and board members actively work to establish relationships with other local, state, and national organizations interested in funding or collaborating with EDCI. This approach of building on existing resources lends itself to replication not only in other Durham neighborhoods, but in cities across the country. The initiative also has made the collection of data and its independent analysis a core practice. From its inception, EDCI has partnered with the Duke Center for Child and Family Policy at Duke University to evaluate its core programs. This partnership, the data generated, and the analysis of it, inform EDCI’s work and help guide ongoing changes to its strategy in order to improve outcomes for the children and families it serves. Partners also collect key implementation data, such as the number of parents served by their programs and outcome data like parent engagement, kindergarten readiness, and literacy. The Center has been able to collect only limited student-level data from school in its first few years working with EDCI but hopes that it will encounter fewer challenges going forward and be able to obtain more consistent data on attendance, discipline, and academic proficiency. It currently has access to data for students whose parents consented to have it collected available in a statewide database for public school students that is housed at the NC Education Research Data Center at Duke University. Sharing evaluations with partners advances accountability: it enables EDCI to ensure that partnerships it develops make sense and to help partners improve the services they provide. The data have been used to enhance programs, like recruiting more parents to sign their children up for summer camp, and EDCI Advocates can access the data to help better connect families with targeted community resources. The evaluation team has also identified a comparable Durham neighborhood, with the goal of using that baseline to assess the community-level impacts of EDCI on the Zone in the future. A variety of district, state, and federal policies affect EDCI’s work and the success of East Durham children and families. For example, EDCI families benefit from policies that enhance access to childcare subsidies, early learning opportunities and school breakfast and lunch programs. Because it sees every day the range of factors that affect Zone families’ lives, EDCI also understands the benefits of policies that promote supports for immigrant families, children’s and adult’s mental health, and economic opportunity and security for families (e.g., housing, jobs). A significant increase in the number of charter schools in Durham has put financial strains on the traditional public schools with which EDCI works; it has also caused EDCI leadership to reexamine how the initiative relates to children from the Zone who attend these schools. EDCI has evolved to become a more child-focused model and, says President and CEO David Reese, is less interested on where a child goes to school than supporting schools that have the best interests of the children they serve in mind.18 As such, some of the initiatives strongest partnerships now include local public charter schools. Between its 2011 inception and 2017, when the most recent evaluation data were collected, 1612 children from 845 families have been enrolled in EDCI. 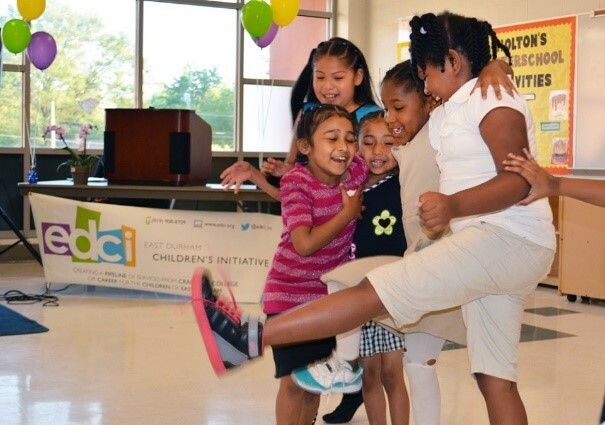 20 In the initiative’s sixth year, nearly 1,000 children were active in at least one EDCI program, and almost half (43%) participated in three or more programs, demonstrating intensive dosage and, thus, greater impact for a large share of Zone kids. 291 families with newborns, over half of all Zone births, have received a Durham Connects nurse home visit since 2011, which provide interventions and education designed to improve health outcomes and reduce the risk of child maltreatment. And over 200 families with children ages 0-3 have participated in Healthy Families Durham/ Jumpstart home visiting since 2011, resulting in improved parenting skills and home environments and high immunization rates. 128 families with children ages 0-5 worked with an EDCI Early Childhood Parent Advocate in Year 6. Virtually every parent reported receiving helpful resources from their Parent Advocate that improved their child’s learning, and 94% of children working with a Parent Advocate for two years showed developmental and age-appropriate skills. Parents also reported significant increases in their time spent telling stories and singing to their children each week. 51 children and parents attended EDCI Story Hour, a weekly program promoting early literacy and parent engagement. EDCI staff also refer families to other early intervention services, like speech therapy and hearing tests; 23 families were referred in 2017. Since 2012, 170 children have participated in Stepping Stones, a kindergarten readiness program at Y.E. Smith Elementary offered in partnership with Duke’s Office of Durham and Regional Affairs. In 2017, three quarters of participating children were assessed as kindergarten ready across four key domains of school readiness: self-regulation, social expression, kindergarten academics, and motor skills (up from just 12% at the start). 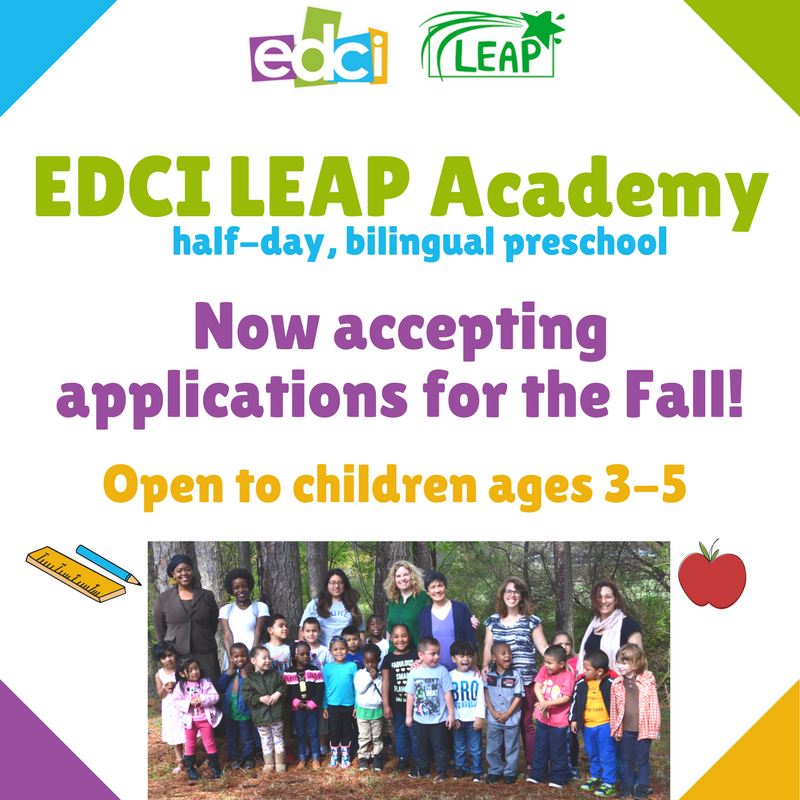 Recruitment flyer for EDCI LEAP Academy; EDCI’s half-day, bilingual preschool. Since February 2015, EDCI has partnered with LEAP (Latino Educational Achievement Partnership) to offer high-quality, half-day preschool for English and Spanish-speaking families living in the Zone. In fall 2016, the Academy expanded to include an afternoon session as well, and in 2017, it served 33 students ages 3-5. 23 Since 2015, 95 percent of Academy graduates have been assessed as kindergarten ready. In addition, transition-to-Kindergarten activities for rising kindergarteners and their parents were offered at Y.E. Smith and Eastway Elementary Schools by Durham’s Partnership for Children in collaboration with school staff and EDCI. And evaluation data show that the longer children are enrolled in EDCI, the better their early literacy scores and attendance, and the more programs kindergarteners are enrolled in, the lower their rates of tardiness and truancy. Thanks to the support of over a dozen partners, 29 students participated in EDCI STEAM Saturdays workshops, a program newly enacted in Year 6. Over 60 fourth and fifth graders participated in the first year of EDCI’s Youth Leadership Council, where students had the opportunity to create original projects focused on improving health opportunities in the Zone, including mobile farmers markets, a school walkathon, and a community field day. Several EDCI partners engaged Zone children in additional out-of-school learning opportunities, like Kidznotes and Girl Scouts, and DPS Community, and dozens of families received low-cost memberships to the Museum of Life and Science. Since its inception, EDCI has built up capacity for students to enroll in a variety of summer camps. In 2017, more than 180 students attended three summer camps: EDCI STEAM Summer Camp, EDCI BELL Summer Camp, and YMCA Camp High Hopes. YMCA summer camp students averted any losses in literacy, while students who participated in the STEAM summer camp made significant gains in literacy, and BELL summer camp students gained a month in literacy and one and a half months in math. Also that year, EDCI launched its first staff-operated camp through a partnership with NC State University’s College of Education. Professors designed the curriculum and trained student teachers to instruct daily classes in reading, writing, and math. In addition, all Y.E. Smith and Eastway Elementary School students receive 10 free books to read over the summer through Book Harvest’s Books on Break. EDCI uses multiple strategies to help families access healthy food through partnerships with key service providers. In the initiative’s most recent year, twenty families participated in parent-child cooking classes and food education, 58 families got support from EDCI staff to access food pantries and apply for SNAP, and 73 families participated at mobile farmers markets. 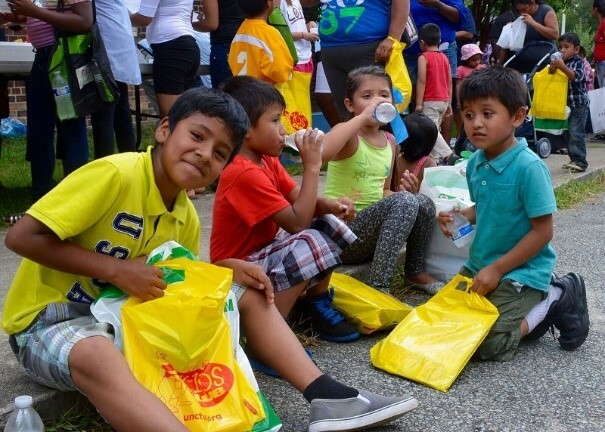 And just in that one year, 563 children and adults enjoyed over 5,000 hot, healthy meals at EDCI Summer Lunch, with food provided by the Inter-Faith Food Shuttle. Health is advanced through both medical and non-medical paths. The relationships it cultivated enabled 20 children to play on two EDCI basketball teams in Durham Parks and Recreation’s league. And EDCI staff connect Zone families not only to nutrition supports, but also to health services, like helping them access mental and behavioral health services and Medicaid. Children and parents enjoying a variety of fun, family activities at EDCI”s Big Day of Play, hosted in partnership with Playworks NC. EDCI’s two-generation approach is well-suited to enhance parents’ skills and abilities. In 2017, 27 parents participated in English for Speakers of Other Languages classes offered by the Durham Literacy Center, helping to both build their language skills and better support their children’s education. And 32 women living in the Zone pursued career opportunities thanks to assistance with resume- and cover letter-writing and career coaching from Dress for Success. Parents are also empowered by support for their children at school: nearly 500 students received new backpacks stuffed with school supplies in 2017, and over 400 children and adults attended EDCI’s End of Summer celebration. That approach is also designed to advance community development more broadly, and EDCI parents report that it is working. Virtually all parents surveyed (93%) said that EDCI helped them feel more connected to their neighbors, and over four in five reported telling a friend or neighbor about EDCI programs and services. Mary Mathew, Director of Program Planning and Partner Engagement, [email protected], (919) 908-8709, or visit www.edci.org. 1. WStrauss, B. (2009). [Duke University’s Children’s Environmental Health Initiative: Population demographics within EDCI neighborhood estimated from 2000 Census data]. Unpublished data. 2. Gih, B. Population Demographics within EDCI Neighborhood Estimated from 2015 American Community Survey Data. 2017. Rice University’s Children’s Environmental Health Initiative Unpublished data. 3. This Zone-specific data comes from various unpublished data sources including the Child Care Services Association, NC Center for Health Statistics, Durham Public Schools, Durham County Social Services, Durham County Dept of Public Health, and MDC. They are all mentioned and referenced in EDCI’s 2010 Promise Neighborhood Grant Narrative—Reference: EDCI Promise Neighborhoods Planning Grant Submission, 2011. U.S. Department of Education, and the child maltreatment data was updated in the EDCI Year 3 Evaluation Report. 5. Personal communication with David Reese, EDCI President and CEO, on April 27, 2018. 7. For a list of EDCI partners, visit the EDCI website. E. Snyder, N. Lawrence, and K. Rosanbalm, East Durham Children’s Initiative: Year Three Evaluation Report, Durham, NC: Duke University Center for Child and Family Policy, 2014. 10. Response to EDCI Summer Camp 2014 Parent/Caregiver Survey. 14. Elaine Weiss personal communication with Lauren Stephenson, EDCI Development Manager, April 10, 2018. 16. Figure 2, State Funding Distribution, and 5, Fiscal Effort- Gross State Product, Education Law Center 2018. 17. Figure 9, Wage Competitiveness, Education Law Center 2018. 18. Elaine Weiss personal communication with David Reese, April 2018. 19. If not otherwise referenced, data below are from this report: E. Snyder, N. Lawrence, and K. Rosanbalm, East Durham Children’s Initiative: Year Three Evaluation Report. 20. East Durham Children’s Initiative Impact Summary, Year 6. 22. This is a rough estimate based on Stepping Stones data. EDCI leaders know that more children in the Zone have accessed child care via prioritization, referrals, NC Pre K assistance, and LEAP Academy, but it is not possible to know the specific percentage for Zone kids. 24. Response to EDCI Parent/Caregiver Survey 2017. 25.East Durham Children’s Initiatve: Year Two Report. Completed by Duke Center for Child and Family Policy, December 2013.